Patricia Ann Cole, known professionally as PP Arnold, is an American soul singer who enjoyed considerable success in the United Kingdom from the 1960s onwards. Raised in the African-American Watts ghetto of Los Angeles, Arnold joined the Ike & Tina Turner Revue in the mid-60s. In 1966 she quit the Ikettes and moved to London where she established a solo career. In London Arnold began a working relationship with many British musicians including her labelmates Small Faces, who backed her on several recordings. Arnold was featured as backing vocalist on two of the group’s biggest hits, “Itchycoo Park” and “Tin Soldier“. Other credits in this period include her duet with Rod Stewart on the single “Come Home Baby” (produced by Mick Jagger on Immediate Records, with Ron Wood on guitar, Keith Richards on bass, Nicky Hopkins on electric piano, Keith Emerson on Hammond organ and the Georgie Fame Brass Section), as well as Chris Farlowe‘s version of the Motown standard “Reach Out (I’ll Be There)” (with Albert Lee on guitar and Carl Palmer on drums). After the collapse of Immediate Records in the late 1960s, Arnold signed a production contract with the Robert Stigwood Organisation and released two singles on the Polydor label, produced by Barry Gibb, but a planned album with Gibb was never completed. Between 1969 and 1970, she recorded eleven songs which were produced by Gibb himself but only two of the songs “Bury Me Down By the River” and “Give a Hand, Take a Hand” were released. In February 1970, she sang harmony vocals on the song “Born” which was included on Gibb’s debut solo album The Kid’s No Good. In the 70s Arnold contributed backing vocals for many notable UK and US recordings including the original 1970 album recording of the rock musical Jesus Christ Superstar, Nick Drake‘s “Poor Boy”, and recordings by Dr. John, Graham Nash, Gary Wright, Manassas, Nektar, Jimmy Witherspoon, Nils Lofgren and Eric Burdon. She toured with Eric Clapton, who also produced a number of unreleased sessions with her; during these sessions she met American bassist Fuzzy Samuels of Crosby, Stills, Nash & Young, and they subsequently became involved romantically and had a son, Kodzo. In 1974 she sang on the Freddie King album Burglar and feeling out of place in the rapidly changing British music scene of the mid-1970s, Arnold and Samuels returned to her hometown of Los Angeles. While living there, Arnold’s relationship with Samuels ended and just two weeks after the split, her daughter Debbie was killed in a car accident. After her daughter’s death, Arnold withdrew from public life for some time, not re-emerging until 1978. At this time she was reunited with Barry Gibb, who wanted to complete the never-finished solo album for her. 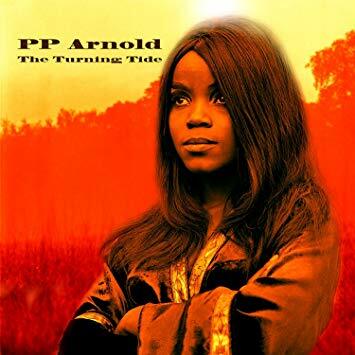 PP Arnold was able to release these “lost” recordings in 2017 as the album “The Turning Tide”. This album is, in my opinion, a masterpiece. It features Arnold’s vocals accompanied by many great musicians of the era with tracks produced by Barry Gibb, Eric Clapton, and Caleb Quaye. Gibb produces 8 of the 13 tracks, Quaye produces 2 tracks, and Clapton produces and plays guitar on 3 tracks – the Steve Winwood / Jimmy Miller song by Traffic “Medicated Goo”, Van Morrison’s “Brand New Day”, and the Mick Jagger / Keith Richards composition “You Can’t Always Get What You Want”. The highlight, for me, is the 1970 Barry Gibb composition “Born” which Gibb produces. What a band! Why did it take 47 years for these to be released?